Chimpanzees, along with another great ape called bonobos (the gracile chimpanzee), are our closest living genetic relative on earth today. They share over 98 per cent of the genetic material that makes us all human and as a result, their behavior, cognition and even their emotional experiences are very like what we personally experience on an everyday basis. The work of Dr. Jane Goodall, DBE, and the generations of primate scientists she inspired have taught us a tremendous amount about the beautifully complex lives that each of these chimpanzees live. It is somewhat of a familial tragedy therefore, that we humans are the cause of so much difficulty for this amazing species, both in captive situations and in the wild. About a century ago, there were hundreds of thousands more chimpanzees roaming throughout central Africa than exist today. Their populations have been and continue to be assailed by human encroachment and its associated outcomes: disease risk, habitat loss and the illegal and unsustainable bushmeat trade. Without significant change, wild populations are in serious danger of disappearing. 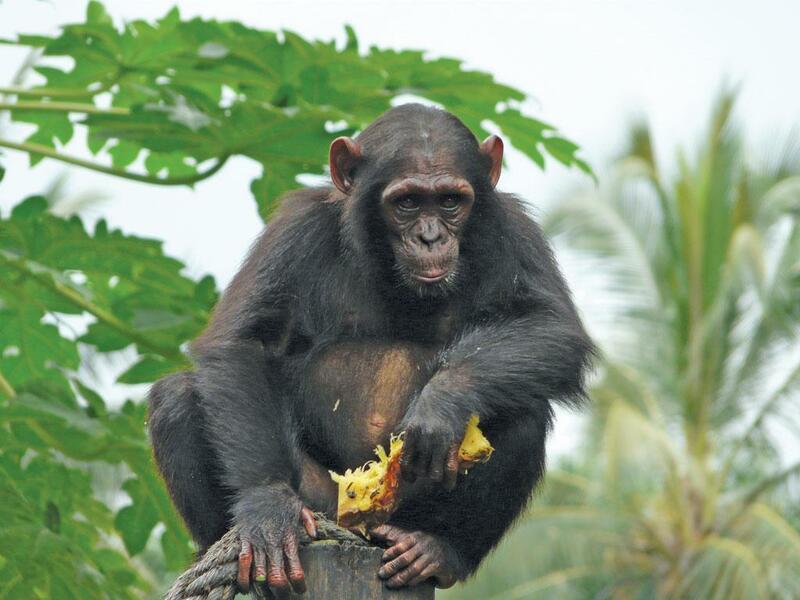 Chimpanzees have been challenged in captive situations as well. While some chimpanzees live in suitable enclosures in accredited zoos and sanctuaries worldwide, many others have been subjected to much more difficult lives as personal pets or subjects of frivolous entertainment. Some countries, such as the United States, have used chimpanzees as subjects of medical tests until very recently. Chimpanzees are a robust and adaptable species, but hundreds of chimpanzees around the world today are coping with unsuitable living conditions. Only purchase wood products that have been harvested with the needs of wildlife in mind. Products certified by international non-profit, Forest Stewardship Council (FSC), come from companies that are working to minimise the impacts of logging on local chimpanzees and other endangered species. Do not support media misrepresentations of chimpanzees, such as advertisements or television shows that display them in clothes or in human conditions. Studies show this lowers public appreciation of them as an endangered species in the wild. Support organizations that have invested in the proper care of this species. Chimpanzees can live past 50 years of age, so only accredited zoos and sanctuaries who have the expertise and financial stability to provide lifetime management and suitable physical and social environments for this species should be entrusted with their care. Chimpanzees are like us in so many ways. They deserve the care and treatment that all of us would want to have ourselves. On the first-ever World Chimpanzee Day, we should consider the ways we can help our chimpanzees and ensure that future generations can enjoy sharing the earth with our closest living relatives.